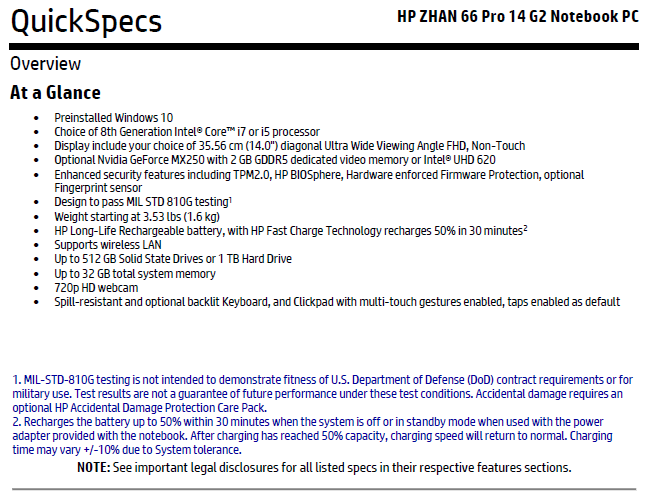 A spec sheet of the HP ZHAN 66 Pro 14 G2 has leaked online that lists the notebook sporting an NVIDIA GeForce MX250 GPU with 2 GB GDDR5 VRAM. This is the first listing of the MX250 in the wild and from the information we have, it is just a rebranded MX150 with slightly higher clocks. So, while the RTX 2000 Turing GPUs will be getting mobile versions, NVIDIA could still continue to offer a rebranded Pascal GPU for entry-level notebooks and ultrabooks. The low-end NVIDIA GeForce MX150 GPU that graced many laptops in 2018 is likely to get an upgrade if a leaked spec sheet of a HP notebook is to be believed. 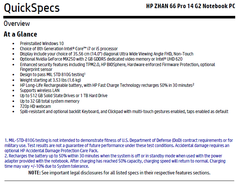 The notebook being listed is the HP ZHAN 66 Pro 14 G2. We've not heard of this SKU from HP before but a quick search throws up results for the ZHAN 66 Pro 14 G1. It is possible that this is restricted to specific markets such as China. The spec sheet lists that the ZHAN 66 Pro 14 G2 will sport an NVIDIA GeForce MX250 GPU with 2 GB of GDDR5 memory. There is speculation that the MX250 could be based on Turing given that evidence for TU107 and TU108 is already available. However, we have information that the MX250 is just a rebranded MX150 based on the same GP108 Pascal GPU with 384 shader cores and a 64-bit memory bus. The only incentive here is the slightly increased core clocks over the MX150 (exact clock speeds are not yet available). Apart from a regular 25W TDP version, the MX150 also had a 25% slower 10W '1D12' version that not many were aware of thanks to NVIDIA's furtive marketing and the same can be expected in the case of the MX250 as well. Performance in games and apps is, therefore, expected to be largely reminiscent of the MX150. While we have no reason to doubt the information available so far, do note that things can change before release. Laptops based on the GeForce MX250 are expected to be announced during CES 2019 with broad availability sometime later in Q1 2019. While we know that NVIDIA will be releasing mobile Turing for notebooks at CES 2019, it looks like the entry-level solutions will still be Pascal based as of now. Do have a look at our dedicated NVIDIA GeForce MX250 page for detailed specs and technical information and also our comparison article to see how the MX150 fares against the 940MX.